Alxo srl, with more than 35 years of experience in window and doors, is bringing a new proposal in the market. 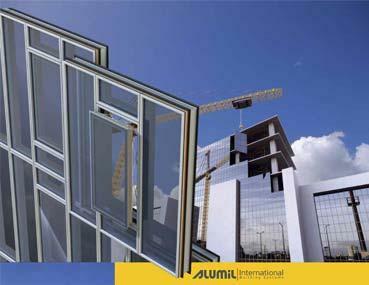 Alxo srl is now the retailer of ALUMIL International Building Systems for the Italian market, offering high technology systems and full technical support on the entire production cycle. With more than 7.000 square meters in Verona's branches, Alxo is now completing its offer with a well-provided stock of materials and equipment for windows and doors fabrication. This references is designed to be a priceless guide for architects, designers and develpers. Alumil's have collected togheter numerous significant projects that we have implemented with our partners around the world, each one having its own distinctive features and architectural requirements. We are really proud that most of our products have become a references point in the Aluminium Industry and are being consistently chosen by the most discerning customers. We, at Alumilm are inspired by your needs and we hope that browsing this references will be a pleasant and inspiration experience for any yout future projects. Highest level of protection from burglaries, vandalism, fire, smoke, earthquake, ecc with high aesthetic combined with latest architectural trend. By using the highest thermal brake aluminium systems, solar protection, controlled ventilation system and integrating photovoltaic systems. In extreme weather conditions (highest resistance to wind and water resistance).